And I love Thanksgiving turkey. But I always end Thanksgiving with a massive amount of leftover turkey…certainly more than we can eat plain before getting sick of it. Over the years, I’ve come up with several family-favorite recipes for turkey leftovers, and I’ve gotten creative with our use of our beloved Thanksgiving food. I make several of these dishes the week after Thanksgiving, and I freeze some turkey so that we can use the turkey for soups and other easy dishes during those busy December nights. Basically, any dish that calls for cooked chicken or turkey can be made into a Thanksgiving turkey leftovers recipe. In sandwiches, salads, soups, and casseroles, you can’t even tell the difference! I always buy more bird than we need so that I’ll have plenty of leftover meat to use for meals between Thanksgiving and Christmas. And because the recipes are so diverse, we don’t get sick of eating so much turkey! 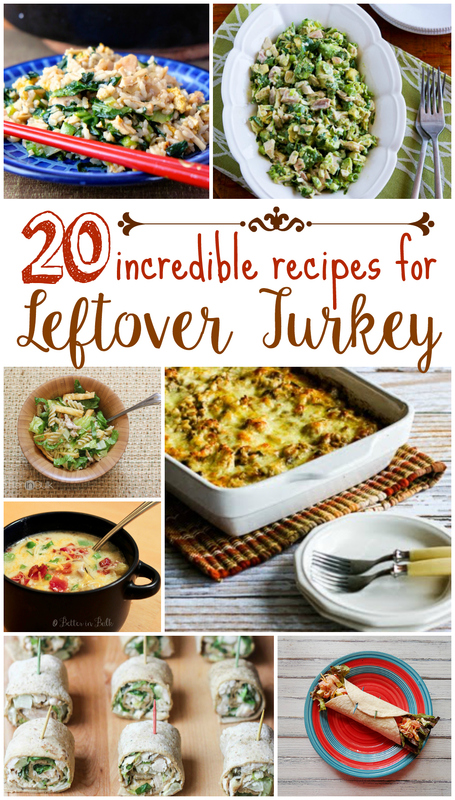 What are some of your favorite ways to use leftover turkey? Feel free to add your recipe links to the comments below. I’d love to try them! Not sure why I am just seeing this, but thanks so much for the shout-out; sharing now! since it is just me to eat the turkey (and my dogs) these recipes are wonderful. i usually just cook the turkey, cut it up and refreeze it, sometimes i will save the large bones to add to soup. the Turkey Cranberry Panini looks wonderful because i have cranberries as well. Looks like a great list of recipes. I didn’t cook the turkey for Thanksgiving so had no left overs but I will for Christmas.